How long it will take for shipping depends on the shipping method that you have chosen. The most common shipping methods are shown below. Also keep in mind that it will take 1-2 business days to process your order. Please add that time to the shipping time frames below. Most items are shipped from our Phoenix warehouse (zip code 85007), but some items are drop shipped from the manufacturer (as noted in the product description). Shipment times for drop shipments will vary from those described below. Packages using these shipment methods average 7-14 days for delivery. These packages are shipped the most economic way possible. Depending on their weight these packages will be shipped via USPS, FedEx Smart Post (which uses FedEx to a major post office and then USPS for final delivery) or FedEx Ground/Home Delivery. Packages shipped via Expedited Flat Rate average 1-5 business days. Packages are shipped via FedEx Ground / Home Delivery, USPS Priority Mail or USPS First Class mail based on the best economic rate which will arrive within 5 business days. The transit times vary based on your location. 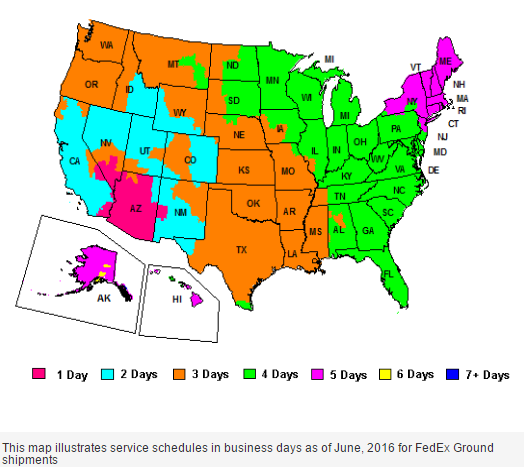 A map of typical transit times from FedEx is shown below. Overnight delivery to most US addresses. See https://www.usps.com/ship/service-chart.htm for more details. 2-3 day delivery to most US addresses. See https://www.usps.com/ship/service-chart.htm for more details. USPS does require 14 days for delivery before they will open a "case" for non-service. 2-8 day delivery to most US addresses. See https://www.usps.com/ship/service-chart.htm for more details. USPS does require 45 days for delivery before they will open a "case" for non-service. International Shipments: Please be aware that your country may charge you additional taxes, handling, or brokerage fees upon delivery. Please check your local customs office for more information. We are honest on all customs, please do not ask us to do otherwise. 3-5 day delivery for many major markets. See https://www.usps.com/ship/service-chart.htm for more details. 6-10 day delivery for many major markets. See https://www.usps.com/ship/priority-mail-international.htm? for more details. USPS does require 4 weeks for delivery before they will open a "case" for non-service. Delivery time varies by destination. See https://www.usps.com/ship/first-class-international.htm?. USPS does require 6 weeks for delivery before they will open a "case" for non-service. We have partnered with MyUS.com to offer convenient, fast international shipping to more than 225 countries for our customers. MyUS.com members receive deeply discounted shipping rates, exceptional customer service, 24/7 online access to their account, and access to other services.Sign up with MyUS.com and receive your own U.S. street address to receive merchandise. MyUS.com provides specialized international package forwarding services from your new U.S. address to your international address.When you use MyUS.com to your U.S. street address you qualify for FotoBella's free shipping on orders over $100 and flat rate shipping for orders under $100. If you are ordering multiple items from us, you'll enjoy the most savings by using MyUS.com Premium Service. This gives you the ability to consolidate packages, which saves you even more on international shipping.Tracking your order: After placing your order, you may click the "My Account" link at the top right hand side of our site to track the status of your order. You will receive an email shipment confirmation from [email protected] when your order has shipped and tracking information within 24-48 hours of shipment via email.How much is shipping?